The women’s field is also loaded. In order for Clijsters to repeat as champion she will have to navigate through a stellar field including five-time Sony Ericsson Open champion Serena Williams, three-time champion Venus Williams, three-time Grand Slam champion Maria Sharapova, World No. 1 Caroline Wozniacki, third-ranked Vera Zvonareva, and 2010 French Open champion Francesca Schiavone. The 2011 Sony Ericsson Open will once again be a global event with players representing 37 countries competing. But the Sony Ericsson Open is more than just tennis, it is a total entertainment experience. High fashion, fine food, fabulous shopping and celebrity musical performances have made the tournament the most glamorous on tour. Come see why huge crowds as well as the biggest names in music, entertainment and sports like Owen Wilson, Adrien Brody, Kim Kardashian, Anna Wintour, Jimmy Buffett, Shakira, Paulina Rubio, Alejandro Sanz, Kelly Rowland, Enrique Iglesias, Anna Kournikova, Jack Nicklaus, Dwyane Wade, Terrell Owens and Helio Castroneves visit the Sony Ericsson Open each spring. You can call the Sony Ericsson Open ticket office at 305-442-3367 or email the ticket office at tickets@imgworld.com for more information. 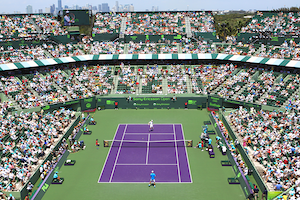 ABOUT THE SONY ERICSSON OPEN: The 2011 Sony Ericsson Open will be played March 21-April 3 at the Tennis Center at Crandon Park in Miami. The two-week combined event is owned and operated by IMG and is widely regarded as the most glamorous event on the ATP and WTA Tours drawing over 300,000 guests each year including the biggest names in music, entertainment and sports. The Sony Ericsson Open is one of nine ATP World Tour Masters 1000 series events and a Premier Mandatory event on the WTA Tour, and features the top men’s and women’s tennis players in the world including defending champions Andy Roddick and Kim Clijsters. For ticket information, call (305) 442-3367 or visit the website at http://www.SonyEricssonOpen.com.